With 24 bureaus across Asia and 1,300 local and international reporters, the Nikkei Asian Review is the only global publication to offer you and your teams a truly Asian perspective. Focusing on 300 of Asia’s most influential companies and with in-depth coverage of the political, economic, business and markets news shaping the region, Nikkei Asian Review gives you the insight you need to make effective business decisions. Discover how online access to Nikkei Asian Review can help you and your teams understand a region of opportunities. A free trial is available to help demonstrate how Nikkei Asian Review will help your team. Digital - Identify opportunities as they arise. Nikkei Asian Review is available 24/7 and updated as stories break. Print - Delivered to your offices every week, the Nikkei Asian Review print edition contains a round-up of the most important stories. 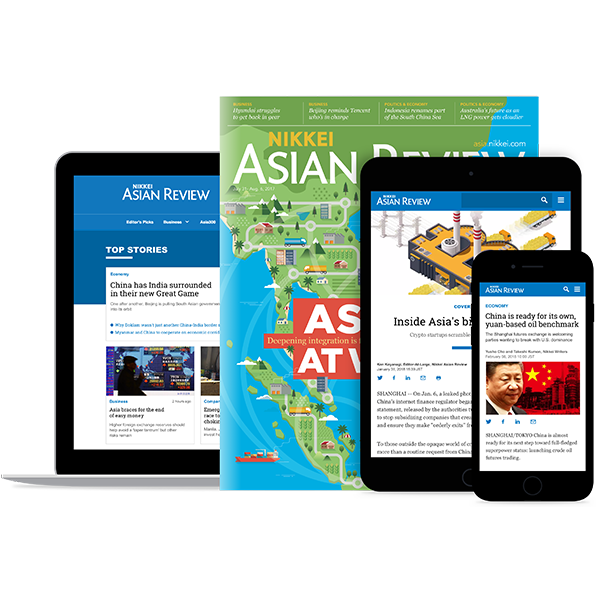 A corporate subscription to Nikkei Asian Review offers your organisation unlimited access to unrivalled analysis of the Asian region. The Financial Times is working in partnership with Nikkei to offer corporate subscriptions to Nikkei Asian Review in the EMEA region. The Financial Times is working in partnership with Nikkei to offer Nikkei Asian Review to organisations located within the EMEA region. To purchase a subscription outside the EMEA region, please visit the Nikkei Corporate Subscriptions website.